Nigeria's major cities offer a wide variety of accommodation, ranging from five-star luxury hotels to serviced apartments and guest houses. Hotels in Lagos and Abuja (the capital city) tend to be notably more expensive than those found in other large cities and towns. Outside of these main urban areas, particularly along the coastline of Nigeria, lodging options usually also include lodges or traditional African huts. In terms of the quality of accommodation in Nigeria, it's worth shopping around. Unless you're staying in a top-end hotel, you will also need to bear in mind that standards may be somewhat lower than you'd normally expect. However, whilst Nigerian hotels often have a reputation for being poorly run, you should be able to find acceptable accommodation in most parts of the country. 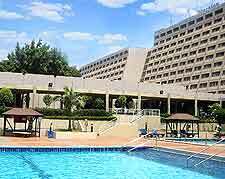 Abuja has hotels in abundance. 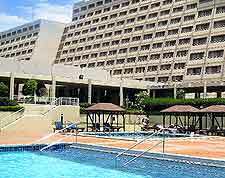 Many visitors, however, opt to stay in one of the well-known brands, such as the Abuja Sheraton or the Transcorp Hilton. These have all the facilities you'd expect of an upmarket hotel, including pools, gyms and shops. As well as five-star hotels, there are also those aimed at the more budget conscious visitor. In addition, for business visitors to Abuja or those wanting a little more freedom than a hotel can provide, there are also serviced apartments in the city. These offer room cleaning, refreshments and laundry facilities. Nigeria's former capital and largest city, Lagos has no shortage of decent accommodation. Staying in one of the many hotels on Lagos Island allows visitors an opportunity to savour the hustle and bustle of this vast city. Neighbouring Victoria Island is also popular with tourists. However, if you're looking for cheap accommodation, your search may take more time. Of note, a number of budget hotels can be found on the Lagos mainland, especially in Surulere. 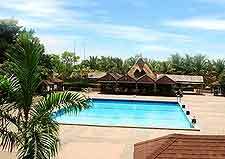 The beach resorts of Nigeria are still relatively underdeveloped, although accommodation at these tourist destinations, which include some of Nigeria's most beautiful beaches, is starting to appear. Beach resorts tend to offer a variety of lodging, such as hotels rooms and suites, pre-erected tents, lodges and traditionally styled African round huts. Many visitors choose to escape the heat by heading inland into the mountains. The Obudu Mountain Resort provides accommodation with a difference, in the form of traditional African huts and stilted lodges.